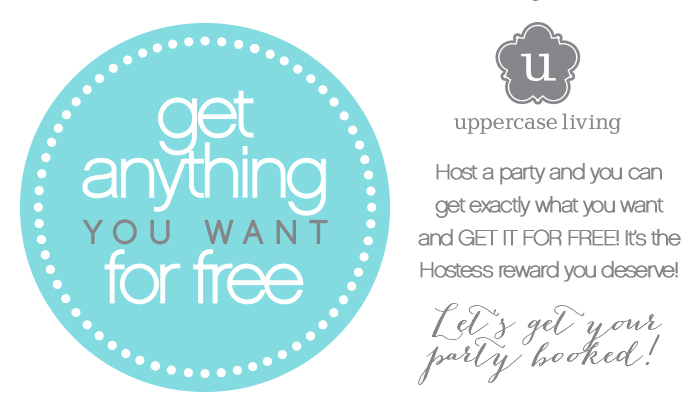 Host an Uppercase Living Party and you could get exactly what you want and get it for FREE! We’ll even help you get to the next level of Hostess Rewards, with our Double-Up Program! It doesn’t get much better than that! Let’s Get the Party Started! Choose which style of party suits you best, and let’s get it booked! Our Hostess Rewards program is one of the BEST in the industry! Everyone loves coming to an Uppercase Living® Party! Don’t keep the Uppercase Living experience to yourself – share it with your friends, family, co-workers, and anyone else you know. Hosting your own Open House is the perfect way to earn free products for yourself and share an inspiring experience with your friends. Don’t forget about your Double-Up Rewards (which can help you increase your Open House total significantly). I would love to schedule an Open House for you today! Let me know your party idea!